Author Miriam Salinas writes her new children’s book, “The Adventures of Ruy Diver,” to bring back the glory of classic story telling with a message. 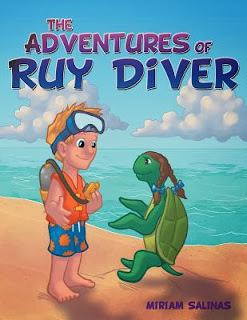 “The Adventures of Ruy Diver” is inspired by Salinas’ son’s passion for the ocean when he was a child and the stories she always told her children when traveling, putting them to bed or occupying them during a boring wait. Ruy learns that anger never solves problems, scary or intimidating people often have a good heart, spending time outdoors with family and friends is great and that there are some amazing creatures in the ocean that could really use our help. Ruy loves the look of the ocean so much that despite his knowing nothing about it, jumps in immediately. It is a good think Rosy the turtle was there to rescue him. Did I mention she can talk? Rosy and her ocean friends are very friendly to Ruy and he makes new friends in Sally Snapper, Sarah Sardine, Joey Fish, and Pete Pompano. Ruy learns that just because someone looks mean and grumpy, doesn't mean that they are. There are four stories incorporated into this chapter picture book. I love that they all go together, but with such a long picture book it makes it nice to have natural breaks. It is a bit too long for my youngest to sit through beyond one story. There are definitely imaginative elements to the story that will excite young readers/listeners. The animals talking for one, the other being that the Ocean is responsible for giving the animals this ability to talk to Ruy, a gift rarely given. The Ocean is able to talk to him as well. Who wouldn't want to hang out talking to ocean life all day long! I love how accepting the animals are of Ruy, they don't judge him for being different (human) but embrace him immediately as a friend. I loved Ruy's adventurous and brave spirit. He was willing to try new things that would have been scarey, but he was able to believe in himself with his friend's help. The dialogue is very well written and easy to follow, sometimes hard in longer picture books with many characters. The author did an excellent job keeping the story moving, and entertaining while teaching and equipping the readers. Miriam Salinas has a background in psychology and a passion for writing. She has written four screenplays that were turned into movies, a book of short stories and one full-length novel. She was born in Mexico and currently lives in Canada, but she spent many years travelling all over the world. She is currently a member of the SPCA, Green Peace, and Polar Bears International amongst others.